Wagner, who held the same position at Dortmund before joining Huddersfield in 2015, left the club by mutual consent on 14 January. Huddersfield are bottom of the Premier League on 11 points - 10 adrift of safety - with 15 games remaining. Siewert's first game in charge will be at home to Everton on 29 January. The club announced the appointment on Twitter with a video of a Manchester City fan from Wakefield, who was mistaken by TV for Siewert during Sunday's game at the John Smith's Stadium, taking a phone call in the manager's office. "Not now, Martin from Wakefield," says the German, adding: "Hi, I am Jan. I am really happy to be the new head coach of Huddersfield Town." Mark Hudson took temporary charge for Sunday's defeat by Manchester City. Terriers chairman Dean Hoyle said: "We enjoyed tremendous success under our previous head coach, David Wagner, and we've subsequently appointed a new head coach that bears many similarities to him; a young, aspirational German from Borussia Dortmund II. Hoyle says the club have "succession plans in place for our key roles" and had followed Siewert's career "with interest". He added: "Given David's success at Huddersfield Town, we knew that it was prudent to look to the future in case an offer came in that he couldn't refuse. David was fully aware that we were undertaking this work - you must prepare for the future. "Jan's name came to our attention in his previous role as assistant manager and Under-19 coach at VfL Bochum. We first spoke with him over two years ago and we've kept in communication since. 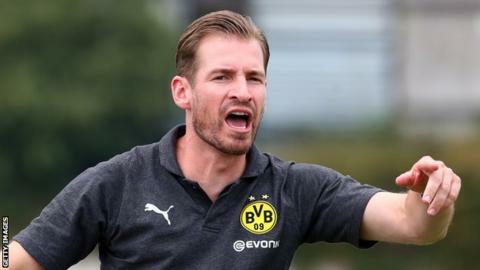 Hoyle also said that Siewert has turned down several approaches to leave Dortmund, but "jumped at the opportunity" to join the Premier League club. "He believes in our ethos and likes what he knows about Huddersfield Town, which made me very proud," added Hoyle. Former Huddersfield captain Peter Clarke says the club need to be realistic and the appointment will have been made knowing they may be playing in the Championship next season. "He is someone who is young fresh, energetic and has different ideas and it's a case of implementing those ideas as soon as he can," Clarke told BBC Radio 5 live. "It is a very tough period and maybe they have one eye on next year. "They have employed the new manager to get his ideas across and work towards a really successful season and have good go to get back in the Premier League should the worse happen come May."